I love movies they’re a passion of mine. So I enjoy reading your reviews. Couldn’t agree more with you more on this review. 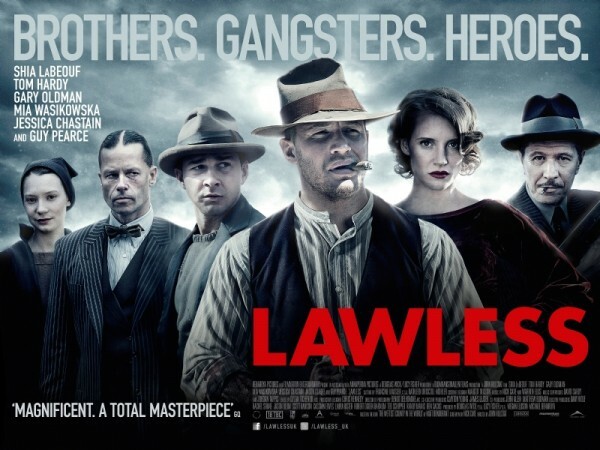 I had high hopes for Lawless but it didn’t meet my expectations the plot seemed rushed most of the time and character development was lacking. Some of the characters seemed to be just thrown into the plot without any expansion on the character. Keep up the reviews I like to see what other movie enthusiast think. Perfect review. Although, I think I enjoyed it a pinch more than you. COMPLETELY agree with your description of Guy Pierce’s character. I left the movie saying that he made it onto my top 5 “oogiest” characters ever. Ick. Brandon, Review that Trouble with the Curve movie! Task 1: The central role of Mrs. Johnstone has been plyaed by, among others, Sarah Haye, Barbara Dickson, Stephanie Lawrence, Clodagh Rodgers, Kiki Dee, Lyn Paul, Siobhan McCarthy, four of the Nolan sisters (Linda, Bernie, Denise and Maureen), Melanie Chisholm (making her West End debut and receiving an Olivier nomination in 2009) and Niki Evans. Mickey has been plyaed by Antony Costa. Steven Houghton plyaed The Narrator. The current London cast stars Lyn Paul as Mrs Johnstone, Stephen Palfreman as Mickey and Simon Willmont as Eddie, with Phillip Stewart as The Narrator. Willy Russell originally wrote and presented Blood Brothers as a school play in 1981 in conjunction with Merseyside Young People’s Theatre. He then developed the musical for a production at the Liverpool Playhouse, in 1983, starring Barbara Dickson and Andrew C. Wadsworth. It was only a modest success. London’s West End on 11 April 1983 at the Lyric Theatre and ran until 22 October 1983, winning the Olivier Award for Best New Musical and another Olivier for Dickson’s performance. The central role of Mrs. Johnstone has been plyaed by, among others, Sarah Haye, Barbara Dickson, Stephanie Lawrence, Clodagh Rodgers, Kiki Dee, Lyn Paul, Siobhan McCarthy, four of the Nolan sisters (Linda, Bernie, Denise and Maureen), Melanie Chisholm (making her West End debut and receiving an Olivier nomination in 2009) and Niki Evans Mickey has been plyaed by Antony Costa. Steven Houghton plyaed The Narrator. The current London cast stars Lyn Paul as Mrs Johnstone, Stephen Palfreman as Mickey and Simon Willmont as Eddie, with Phillip Stewart as The Narrator. injected with undying humor, love and most of all, family. There is really no difference between male and female narcissists.